This month we have discussed important home safety steps you can take to guard against slips and falls. The bathroom is one of the most dangerous rooms in the house, and last week we discussed seven tips to address many common bathroom safety concerns. My hope through this blog series on home safety is to arm you and your senior loved one with the tools needed to remain in the home you love with confidence. Today, we pick up with the many hidden dangers that the kitchen possesses and tips on how to make your kitchen safer. 1. Expired Foods. Take some time this week to clean out the refrigerator, freezer, and pantry and throw out any expired foods. Checking the contents of the refrigerator is often a first indicator if home care is needed. Also, be sure to disinfect all kitchen counter tops, unsanitary conditions and improper food handling could lead to food born illness. 2. Lack of Fire Extinguisher. A kitchen fire, especially a grease fire, can quickly get out of control. A fire extinguisher won’t be missed until it is too late. Make sure you or your senior loved one has easy access to a fire extinguisher that has been checked at least once a year. Remember, a grease fire cannot be extinguished with water (that will only make the fire worse), if a fire extinguisher is not available, use baking soda to put out the flames. If a fire is quickly getting out of control, leave your home and immediately call 911. 3. Too Many Cords. Appliances can be a senior’s best friend for quickly heating up a meal. However, a tangle of old appliance cords can pose a safety risk. Discard any appliances with frayed cords or if the appliances are not working correctly. Do not use extension cords or overload an outlet. 4. Dish Towels and Items Near Stove. A dish towel or a bag placed near a stove top can pose a safety concern especially for seniors with dementia. Another stove top safety concern is a senior’s robe or loose clothing that can catch fire while cooking. 5. Shiny Floors. 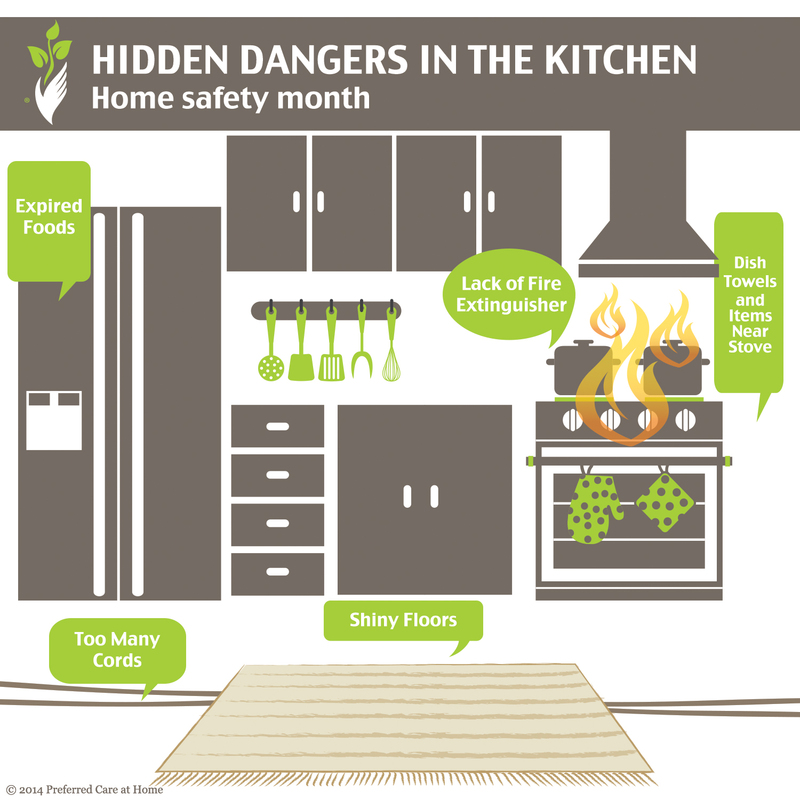 If your kitchen floors are slippery, place non-skid mats and rugs in the kitchen, especially around areas that are wet. If you are considering remodeling your kitchen, choose a matte-finished hardwood floor or laminate. If you are considering a total kitchen renovation, consult a professional to ensure your kitchen is easily accessible to you or your senior loved one. If you noticed difficulty navigating your kitchen safely it may be time to start home care. Contact a location near you to learn about care options in your area and for a complimentary home safety check.